You know that annoying temperature curve where if you’re just a few degrees out you need to start tempering your chocolate all over again? Well with mycryo cocoa butter it’s so much easier to temper chocolate!!! We discovered this at a Meilleur du Chef workshop near Biarritiz and since then my chocolate decorations have been quickly and conveniently produced. Not like before when I’d sometimes be heard mumbling ‘Oh dear, the chocolate isn’t hardening as it should! I could swear I followed that chocolate curve!’ And my softening chocolate shapes would be crying ‘Help! Someone please temper me properly!’ I’m sharing this with you so we can all have easy snappily shiny chocolate decorations that are happy and don’t need to live in the fridge. Yes you’ll have to find some mycryo cocoa butter but it’s totally worth the search and there are links below for ordering this magical stuff online. You just melt your chocolate to a maximum temperature, allow to cool to another specific temperature, stir in a very small amount of mycryo cocoa butter, cool a short time again to a final temperature then use. Oh the relief and joy. Hurray! But what’s mycryo cocoa butter? It’s 100% cocoa butter obtained through roasting and grinding cocoa beans, which is then frozen at very low temperatures to produce a dry powder. 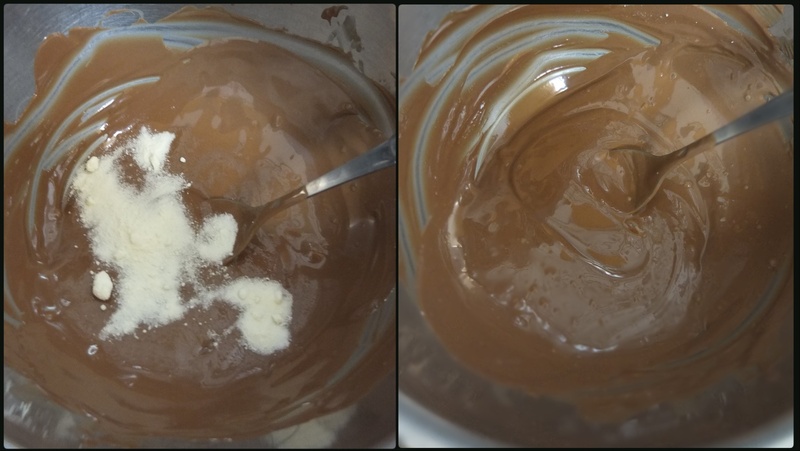 It makes tempering chocolate very easy and you just add 1% (according to le Meilleur du Chef) or 2% (according to Callebaut) to your correctly melted chocolate. There’s information on mycryo cocoa butter on the Meilleur du Chef website, where you can also order it – they do international deliveries. It’s also available on Amazon where the reviewers confirm how easy it makes tempering chocolate but warn you to be careful about the expiry date. I’m still using mine although the expiry date was late last year. Do check the expiry dates on the packaging if you order some. First get a thermometre, probe or preferably laser, as there’s no need to touch the chocolate so it’s less messy. Make sure you use couverture chocolate. If you want really delicious decorations get good-quality stuff like Valrhona Jivara. Check the bowl you’re going to melt your chocolate in is very clean and dry – all your utensils must be dry. Weigh 1% of the mycryo butter so it’s ready to add. To calculate: 100g/3.5oz chocolate + 1g/1/2 teaspoon mycryo cocoa butter; 200g/7oz chocolate + 2g/1 teaspoon mycryo cocoa butter OR 1kg/35.27oz chocolate + 10g/5 tsp mycryo cocoa butter. Tempering white and milk chocolate. 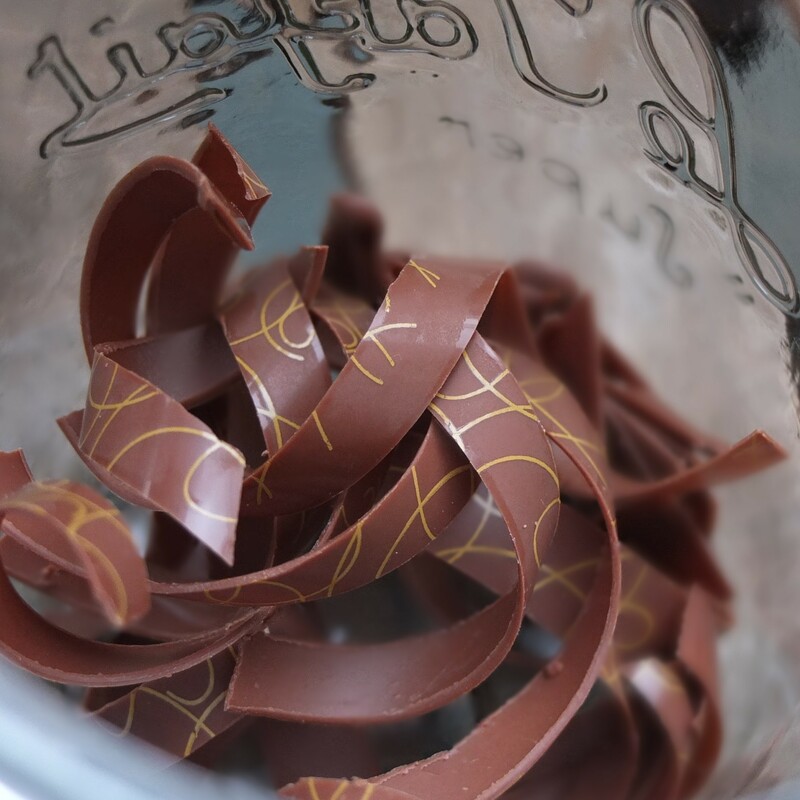 Melt your chocolate on a bain marie (or use a microwave, melting in 20 second bursts, stirring well between each burst and checking the temperature, reducing to 3 or 5 second bursts when almost ready). Make sure your chocolate reaches a temperature of 40ºCelsius/104ºFahrenheit but never goes over 45ºCelsius/113ºFahrenheit. 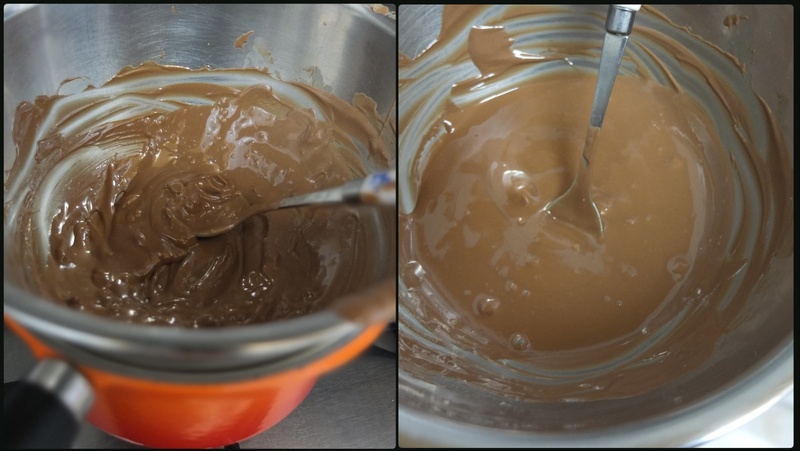 Take it off the bain marie as soon as it gets near and give it a good stir then if necessary return 5 seconds or so at a time, stir and check the temperature. Once off the heat (and off the bain marie) let the chocolate cool to 34ºCelsius/93ºFahrenheit. Sprinkle on the mycryo cocoa butter and wait a few seconds as it melts then stir in to combine. 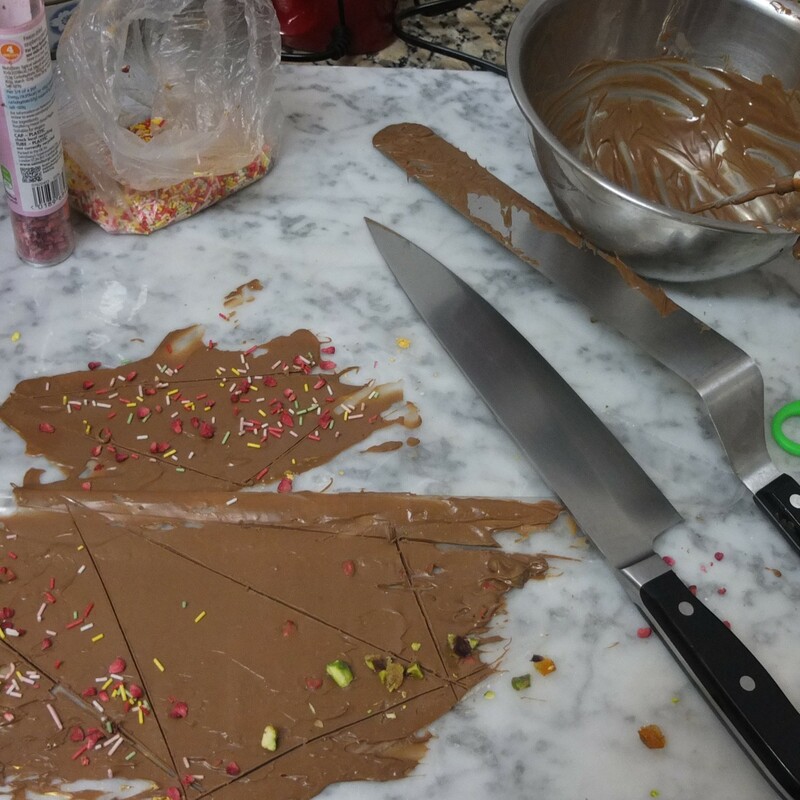 Use a rubber spatula to scrape the chocolate off the sides and fold into the middle. Wait for the chocolate to cool to 28ºCelsius/82ºFahrenheit. Use immediately. If it starts hardening then just heat up again a few seconds or so and stir well until the temperature warms back up to 28ºCelsius/82ºFahrenheit and the chocolate is smooth again. For dark chocolate the process is the same except let it cool not to 28ºC but to 31ºCelsius/88ºFahrenheit then use immediately. 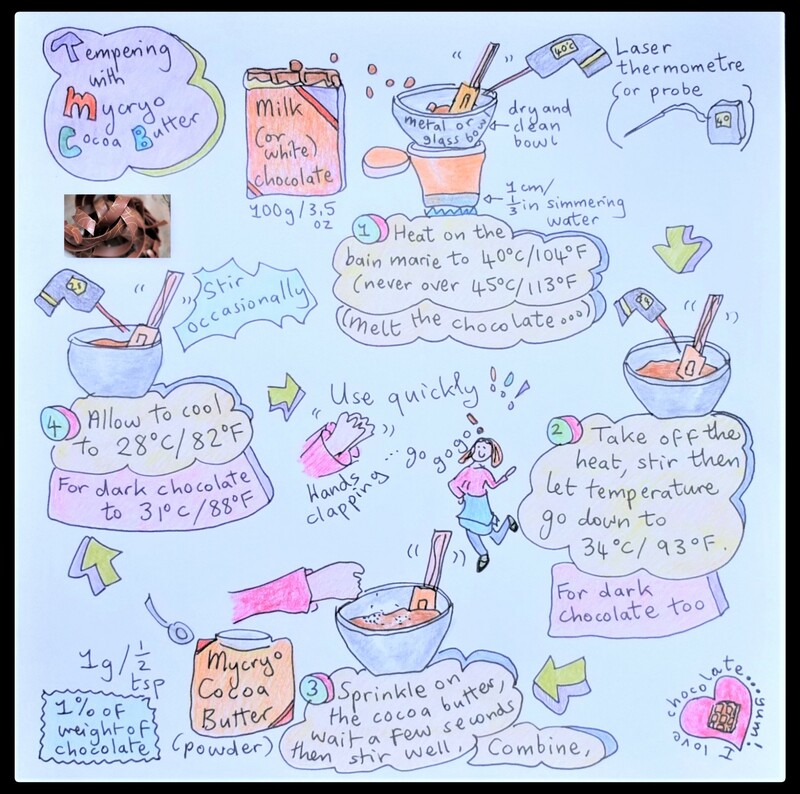 Note: you can also find instructions for tempering couverture milk chocolate are on the Meilleur du Chef website in French here, for dark chocolate here and white chocolate here. Maybe they’ll translate into English in the future but their step-by-step photos should still help you. Psst… little confession, I think my temperatures have not always been as precise as they could be (I blame it on my thermometre) and it still seems to work well!!! I’m much less scared of tempering now. Should I say hurray again? Oh why not… hurray! 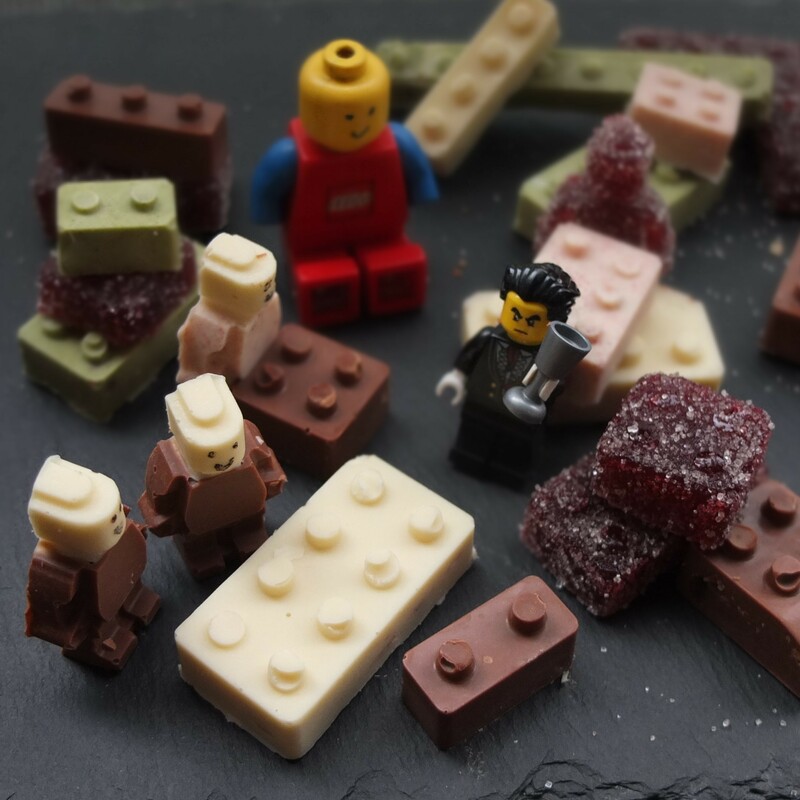 Look, with some moulds from Amazon (or elsewhere) you can make snappy tempered chocolate lego that doesn’t melt to the touch. Very important when you’re building things with it! 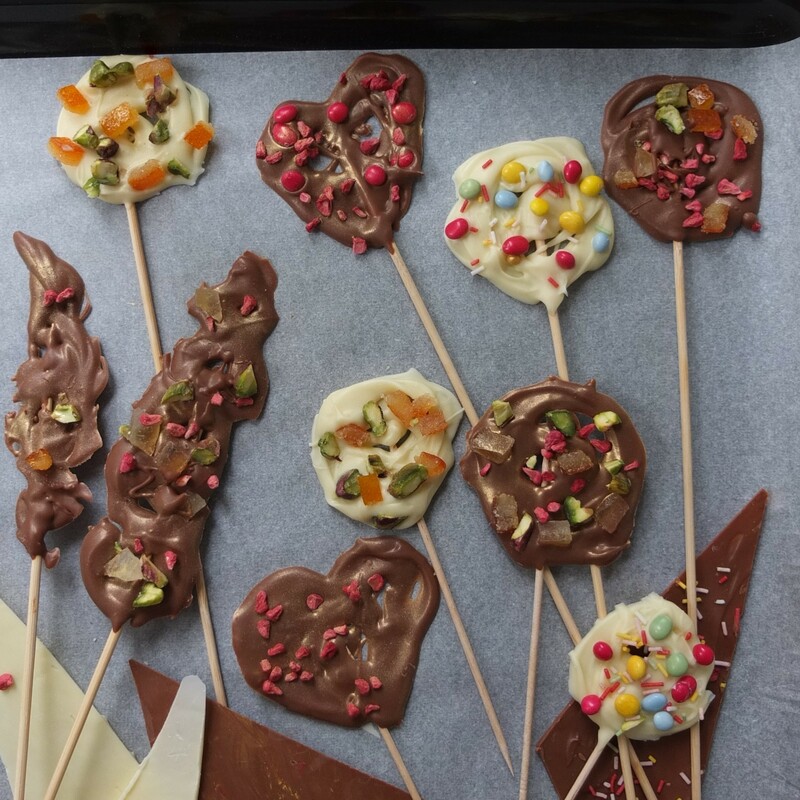 And I’ll leave you with a link to my chocolate lollipops and shards post for how to make decorations with tempered chocolate which includes the same info on mycryo butter but also instructions on actually making decorations. There are tips and links to some useful videos that helped me use a chocolate transfer sheet for the first time and make these curls.